Sheriff Tom Lopez was born and raised in Yolo County. Tom is a fifth generation Yolo County resident. He attended school in the Esparto School District and joined the Sheriff’s Office in 1980 as a Reserve Deputy Sheriff upon graduating from High School. Tom became a full time Deputy in 1984, and transferred to the Sacramento County Marshall’s Office in 1985. 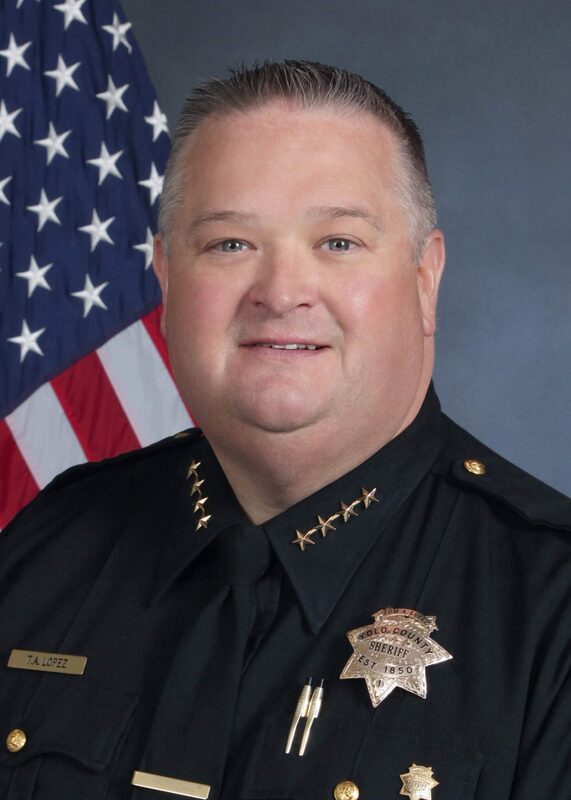 He returned to the Yolo County Sheriff’s Office in 1988 as a Resident Deputy and Field Training Officer in the Esparto–Capay Valley area. Tom promoted to Sergeant in 1993 and supervised Patrol, Security and Investigations at the jail, Legal Services and Investigations. In 1999, he promoted to Lieutenant and was assigned to the Administrative Division where he was in charge of Training, Personnel, Civil and Internal Affairs. In June of 2001, Tom promoted to the rank of Captain. He was assigned to the Detention Division for four years, Field Operations Division for eight months and the Administrative Division for eighteen months. While assigned to the Detention Division, Tom was responsible for the care and custody of 452 inmates and supervised 137 employees. He also oversaw the Office’s Planning and Research Section. As the Field Operations Commander, Tom oversaw the Sheriff’s patrol force. As the Administrative Division Commander, Tom supervised the Personnel Section, Finance Section, and continued to oversee the Department’s Planning and Research Section. On April 28, 2006, Tom was named the “2005 Sworn Manager of the Year” at the Sheriff’s Office annual awards banquet. He was promoted to Undersheriff-Coroner in January 2007 where he was responsible for the day to day operations of the Sheriff’s Office. He held this position for 12 years prior to being elected Sheriff ~ Coroner ~ Public Administrator on June 5, 2018. His term began on January 7th, 2019. Tom holds a bachelor’s degree in criminal justice and was also active in his community serving as a volunteer fireman for the Esparto and Madison Fire Districts. Tom was the Fire Chief of the Madison Fire Protection District for 10 years before retiring after 34 years of service. He has served as a board member on Capay Valley Vision and was a Charter Member of the Capay Valley Rotary. He is a Life Member of the Masonic Lodge and is a member of the Elks Lodge. Tom is married to his wife, Monica. They reside in Woodland and enjoy supporting their daughters in High School sports. Tom also has a son and daughter and three grandsons that all live in Yolo County.